Every girl must start growing with a dream to buy a better house before to have children. Sangkrit eliminates all discrimination by encouraging everyone to clean own space, cook own meals, program own world and blog own mind just to let the women make the most out of it. Anyone can startup online simply by working as personal outlet of the globally distributed order of sangkrit.net to end up contesting own constituency via personal app. It is quite empowering for women to let them find out many new ways of doing things much more efficiently for changing any old ways of doing things forever. Housewives may also startup to find their true freedom that might break their boredom into an exotic pleasure from within their household. Moreover they should learn Hindi as the second language to connect with the most happening economy in the world and consume only freshly cooked vegetarian meals for growing sharp intelligence like ancient Indian Brahmans. 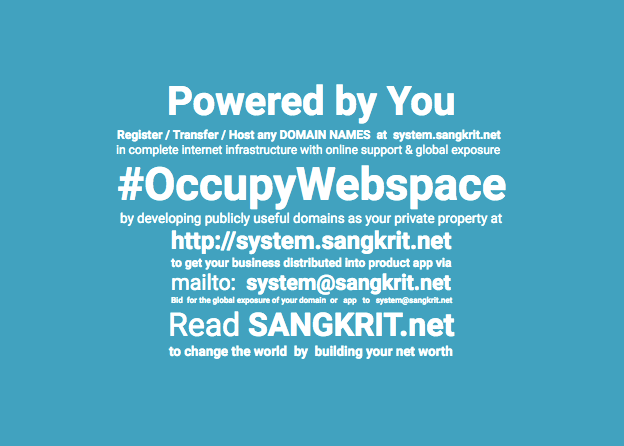 In fact everyone should signup for free sangkrit.net account to startup online and help others also do the same. Every girl must start growing with a dream to buy a better house before to have children. Previous PostBusiness And Politics Made Easy For WomenNext PostWhy You Should Register Domain Names At SANGKRIT.net?